An 18 wheel 2007 Freight Liner semi tractor trailer that was operated by Michael J. Gammon, 47, of Brooklyn, Michigan, overturned just after 2:30 p.m. on Monday as he exited the Mid Hudson Bridge while traveling west on Route 44/55. The accident, which brought traffic in both directions to a complete standstill, took nearly 6 hours to finally clear. 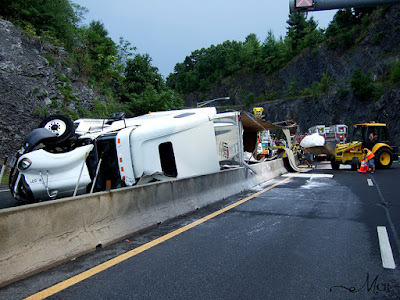 Gammon, who was hauling 42,500 pounds of crushed limestone for Haas Trucking from Connecticut to Morton, Ohio near Cleveland, failed to negotiate the exit turn to the right while leaving the bridge. He was in the slow lane and moved into the fast lane in an attempt to avoid crashing but the truck overturned and fell into the dividing concrete barriers, tearing the roof completely off his trailer and spilling his cargo out onto the roadway. A diesel fuel tank was ruptured but was quickly neutralized by the Highland Fire Department, who arrived on the scene within minutes. Gammon was the sole occupant of the truck and walked away with only a scratch on his wrist. He was later cited for Speed Not Reasonable, Move from Lane Unsafely, Failed to Obey a Traffic Control Device and the Environmental Conversation Law violation of Putting Noisome or Unwholesome Substances on roadway which is a misdemeanor. Besides the Highland Fire Company, the Lloyd Police were also assisted at the scene by Mobile Life Ambulance and members of the New York State Bridge Authority. Gammon said he knew the bridge was 25 mph. "Once I came over the bridge I started speeding up and going with the cars but I never saw a speed limit and the curve," he said. Gammon, who has driven trucks for 5 years, said he has never had a ticket before, calling himself a "perfect driver." "When I came into the curve the cars were still pulling away from me, but it still didn't feel right. I knew it was rolling," he recalled. "You know you turn out of it, you don't turn into it to correct yourself." Gammon's voice cracked, saying he remembered the entire incident. "Oh my god, here comes the wall [and] I leaned away from the driver's door. I know it's going down," he said. "Next thing I know I'm watching stuff fly over my head and I crawled out the sunroof." No other vehicle was involved in the accident. Gammon turned the whole ordeal upon himself, worrying about his wife and the future of his livelihood. "I am totally disgusted with myself as a human being," he said. "I am because I've never done nothing. I'm not that kind of a driver. I've never been on this road before but I never saw what the speed limit was for the curve itself." With tears in his eyes, a distraught Gammon said "I am just crushed as a human because I pride myself better than that." He said he was sorry "for everything that this causes. I am so mad at myself." Gammon said another driver from his company was not too far away and he would be able to ride back home with him."